Stable and repeatable operating parameters are a fundamental requirement for high-quality water jet cutting. KMT Waterjet Systems responded to this demand by developing the FEEDLINE V abrasive metering system. 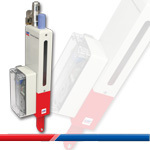 Controlled through a central CNC controller or a potentiometer, the FEEDLINE V supplies the cutting nozzle with the optimized flow of abrasive, saving material and costs. The KMT Waterjet FEEDLINE V system supplies the cutting head with a constant metered quantity of abrasive. Without this controlled supply, the mixing chamber for abrasive, air and water would become clogged up. With the FEEDLINE V, this is effectively prevented. The KMT FEEDLINE PRECISION® Abrasive Metering System is an economical and reliable option for accurate delivery of abrasive to the cutting nozzle. 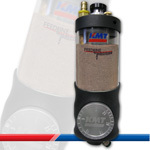 The KMT FEEDLINE PRECISION® abrasive vessel features a variable dial for accurate control of abrasive. The ful l spectrum dial, notched in 1/10 lb. (.05 kg) increments, to deliver precise flow control of abrasive from 0 to 2-1/2 lbs. (1.13 kg)/min. for cutting a variety of materials and thicknesses. The innovative Dial-It-In feature delivers flexible, economical and accurate delivery of abrasive to the cutting nozzle.